The Epistle of Paul to the Colossians, usually referred to simply as Colossians, is the twelfth book of the New Testament. It was written, according to the text, by Paul the Apostle and Timothy to the Church in Colossae, a small Phrygian city near Laodicea and approximately 100 miles (160 km) from Ephesus in Asia Minor. Scholars have increasingly questioned Paul's authorship and attributed the letter to an early follower instead. The authenticity of the letter, however, has been defended with equal strength. During the first generation after Jesus, Paul's epistles to various churches helped establish early Christian theology. According to Bruce Metzger, it was written in the 50s while Paul was in prison. Colossians is similar to Ephesians, also written at this time. Some critical scholars have ascribed the epistle to an early follower of Paul, writing as Paul. The epistle's description of Christ as pre-eminent over creation marks it, for some scholars, as representing an advanced christology not present during Paul's lifetime. Defenders of Pauline authorship cite the work's similarities to Philemon, which is broadly accepted as authentic. The letter may have been written by Paul at Rome during his first imprisonment. (Acts 28:16, 28:30) Other scholars have suggested that it was written from Caesarea or Ephesus. If the letter is not considered to be an authentic part of the Pauline corpus, then it might be dated during the late 1st century, possibly as late as AD 80. Like some of his other epistles (e.g., those to Corinth: 1 Corinthians, 2 Corinthians), this seems to have been written in consequence of information which had been conveyed to Paul of the internal state of the church there by Epaphras[1:4–8]. A faithful minister to the Colossians, Epaphras was visiting Paul when the epistle was written[1:7][4:12]. The letter's authors claim to be Paul and Timothy, but authorship began to be authoritatively questioned during the 19th century. Pauline authorship was held to by many of the early church's prominent theologians, such as Irenaeus, Clement of Alexandria, Tertullian, Origen of Alexandria and Eusebius. 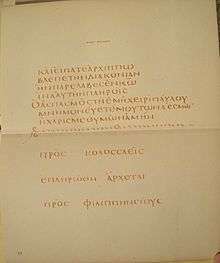 The first page of Colossians in Minuscule 321 gives its title as προς κολασσαεις, "to the Colossians". However, as with several epistles attributed to Paul, critical scholarship disputes this claim. One ground is that the epistle's language doesn't seem to match Paul's, with 48 words appearing in Colossians that are found nowhere else in his writings and 33 of which occur nowhere else in the New Testament. A second ground is that the epistle features a strong use of liturgical-hymnic style which appears nowhere else in Paul's work to the same extent. 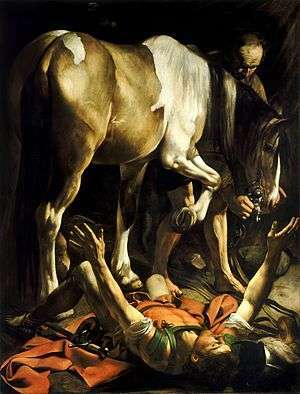 A third is that the epistle's themes related to Christ, eschatology and the church seem to have no parallel in Paul's undisputed works. Those who are advocates of Pauline authorship defend the differences that there are between elements in this letter and those commonly considered the genuine work of Paul (e.g. 1 Thessalonians). It is argued that these differences can come by human variability, such as by growth in theological knowledge over time, different occasion for writing, as well as use of different secretaries (or amanuensis) in composition. As it is usually pointed out by the same authors who note the differences in language and style, the number of words foreign to the New Testament and Paul is no greater in Colossians than in the undisputed Pauline letters (Galatians, of similar length, has 35 hapax legomena). In regard to the style, as Norman Perrin, who argues for pseudonymity, notes, "The letter does employ a great deal of traditional material and it can be argued that this accounts for the non-Pauline language and style. If this is the case, the non-Pauline language and style are not indications of pseudonymity." Not only that, but it has been noted that Colossians has indisputably Pauline stylistic characteristics, found nowhere else in the New Testament. Advocates of Pauline authorship also argue that the differences between Colossians and the rest of the New Testament are not as great as they are purported to be. Colossae is in the region of the seven churches of Revelation 1–3. In Colossians 4:13 there is mention of local brethren in Colossae, Laodicea, and Hierapolis. Colossae was approximately 12 miles (19 km) from Laodicea and 14 miles (23 km) from Hierapolis. Members of the congregation at Colossae had incorporated pagan elements into their practice, including worship of elemental spirits. The Epistle to the Colossians declares Christ's supremacy over the entire created universe and exhorts Christians to lead godly lives. The letter consists of two parts: first a doctrinal section, then a second regarding conduct. In both sections, false teachers who have been spreading error in the congregation are opposed. In its doctrinal sections, Colossians emphatically explains that Christ is begotten before all creation (not created) and is supreme over all that has been created. All things were created through him and for him, and the universe is sustained by him. God had chosen for his complete being to dwell in Christ. The "cosmic powers" revered by the false teachers had been "discarded" and "led captive" at Christ's death. Christ is the master of all angelic forces and the head of the church. Christ is the only mediator between God and humanity, the unique agent of cosmic reconciliation. Interestingly, it is the Father in Colossians who is said to have delivered us from the domain of darkness and transferred us to the kingdom of His beloved Son (Colossians 1:12–13), not the typical way of articulating salvation today. The Son is the agent of reconciliation and salvation not merely of the church, but in some sense redeems the rest of creation as well ("all things, whether things on earth or things in heaven" (Colossians 1:20). The doctrinal part comprises the first two chapters. Its main theme is developed in chapter 2, with a warning against being drawn away from Him in whom dwelt all the fullness of the deity[2:9], and who was the head of all spiritual powers. Christ was the head of the body of which they were members; and if they were truly united to him, what more did they need? Colossians praises the spiritual growth of the recipients because of their love for all the set-apart ones in Christ[1:4][1:8]. It calls them to grow in wisdom and knowledge that their love might be principled love and not sentimentality[1:9-11]. "Christ in you is your hope of glory!"[1:27]. "Christ in you, the hope of Glory"
One of the great themes of the doctrinal section of Colossians is promise of union with Christ through the indwelling life of God the Holy Spirit. For example, Colossians 1:27, "To them God has chosen to make known among the Gentiles the glorious riches of this mystery, which is Christ in you, the hope of glory." The Apostle Paul wrote to remind them of this promise and guard them against moving their on going trust from Christ to other philosophies and traditions which did not depend on Christ. As does 1 Corinthians 13, Colossians 1, in early verses, deals with faith, hope and love. While in the case of 1 Corinthians, the love "does not" statements like boasting recall the criticisms of the Corinthians earlier in the book, Colossians is different. Paul looks at the faith, hope and love of the Colossian believers as evidence and validation of their faith experience. In introductory verses, 1:6,7, Paul states that the fruit seen in them started the day they understood the grace of God in truth. Conduct is a fruit of faith. Colossians denounces ascetic practices or avoiding certain foods because Christ's death put an end to such distinctions. Believers are one in Christ, not divided between circumcised and uncircumcised, slave and free, and so on. He then calls on his audience to fulfill all domestic and social obligations. A striking image of religion by such rules used by Paul is his use of the word "shadows". Some practices in the past may be shadows of what is to come, but Christ is the one who cast the shadow. Colossians does not state with precision what heresies were being faced by the church. There are approximately 44 different theories what the heresies encountered by the church at Colossae were, including a view there was no particular heresy at all but issues typical of those faced by believers. Some argue that it is not merely fasting or feasting or particular area of emotions, conduct or intellect that are denounced but doing them with an independent spirit, not connected to Christ, the head of the body or lack of appreciation of the gospel of grace. The practical part of the Epistle, 3–4, enforces various duties naturally flowing from the doctrines expounded. They are exhorted to mind things that are above [3:1–4], to mortify every evil principle of their nature, and to put on the new man. [3:5–14] Many special duties of the Christian life are also insisted upon as the fitting evidence of the Christian character. The letter ends with customary prayer, instruction, and greetings. Colossians is often categorized as one of the "prison epistles" that include Ephesians, Colossians, Philippians, and Philemon. Colossians has some close parallels with the letter to Philemon—names of some of the same people (e.g., Timothy, Aristarchus, Archippus, Mark, Epaphras, Luke, Onesimus, and Demas) appear in both epistles. Tychicus is named as the bearer of the letter, just as he is in Ephesians and Philemon, and he is to tell the recipients of the state of the apostle[4:7–9]. After friendly greetings[4:10–14], he bids them exchange this letter with the one he had sent to the neighbouring Laodicean Church. 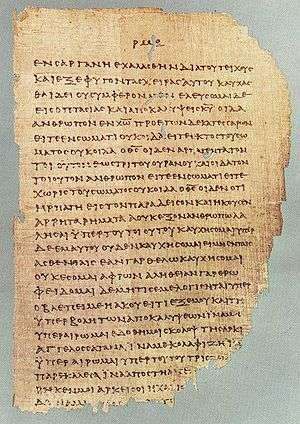 (The Epistle to the Laodiceans was a possible lost letter of Paul which some scholars identify with the canonical Epistle to the Ephesians, others dispute this view.) He then closes the letter with the usual salutation. 1:2. "to the faithful brethren"
1:7. "Epaphras...our dear fellowservant...faithful minister"
4:7. "Tychicus...faithful minister and fellowservant"
4:9. "Onesimus, a faithful and beloved brother"
It is striking that the apostle writes in Col 1:28 [ESV]: "Him we proclaim, warning everyone and teaching everyone with all wisdom, that we may present everyone mature in Christ. For this I [Paul] toil, struggling with all his energy that he powerfully works within me." Then in Col 3:16, Paul's goal is that the Colossians themselves to in some manner continue in this ministry and admonish and test each other, "one another" as Paul did for them. Col 3:16: "Let the word of Christ dwell in you [Colossian believers] richly, teaching and admonishing one another in all wisdom, singing psalms and hymns and spiritual songs, with thankfulness in your hearts to God." In some sense, Paul would have the teaching and admonishing ministry continue by members of the church in Colossae, one method of members admonishing each other is through the rich hymnody and musical heritage of the Christian church. Colossians has some interesting interpersonal dynamics. Epaphras, who first shared the good news to Colossae, near the opening of the book is presented as a beloved fellow servant—"one of us" from Paul's ministry point of view. In contrast, towards the closing of the book he is called "one of you". Onesimus is also referred to as "one of you" and an important helper of Paul who was the run away slave in the book of Philemon who became a believer. His past is not brought up. Mark and Barnabus parted company with Paul over Mark leaving the mission after violent opposition in the book of Acts, but here is reconciled to Paul and spoken of as a comfort. Epharoditus, Paul refers to as a fellow prisoner, we recognize as the person in the book of Acts who was literally dragged through the streets into court on charges. Paul acknowledges that most never saw his face in Colossae or Laodicea, yet was concerned throughout the book they were aware of the events going on with himself, and appointed Tychicus to inform them so that they should understand how great Paul's suffering for them has been. Paul always mentions his own name in his letters and here mentioned Luke, but in the book of Acts Luke himself never mentions his own name, referring to himself more obliquely only by the personal pronoun "we" (as does Matthew in his book). ↑ May, Herbert G. and Bruce M. Metzger. 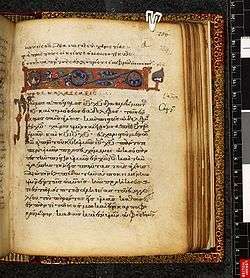 The New Oxford Annotated Bible with the Apocrypha. 1977. ↑ "BibleGateway - : hard". www.biblegateway.com. Retrieved 2016-08-24. ↑ Wright, N. T., Colossians and Philemon, Tyndale New Testament Commentaries (Grand Rapids: Eerdmans, 1986), pp. 34–39. ↑ Mack, Burton L. Who Wrote the New Testament? San Francisco:Harper Collins, 1996. ↑ Koester, Helmut. History and Literature of Early Christianity, Introduction to the New Testament Vol 2. Berlin: Walter de Gruyter & Co, 1982,1987. ↑ Kummel, W.G. Introduction to the New Testament. 1966, p.241: 'Pleonastic "kai" after "dia touto" (Col 1:9) is found in the NT only in Paul (1 Thess. 2:13; 3:5; Rom. 13:6)..."hoi hagioi autou" Col 1:25=1 Thess. 3:13, 2 Thess. 1:10, "charixesthai"=to forgive (Col 2:13, 3:13) only in 2 Cor 2:7, 10, 12:13' etc. ↑ The Holy Bible : New International Version, containing the Old Testament and the New Testament. Grand Rapids, Mich.: Zondervan Bible Publishers. 1984. ISBN 0310902711.